It's very pretty. I don't see that it's any thicker than my other Pashminas. No matter, I like it. Pashmina Shawl Scarf Wrap Border Pattern Double Layered Reversible - 28" x 70"
Bought this Pashmina for my mother as part of her Christmas; she loves it. I loved it so much when I got it I almost didn’t give it to her. The colors are perfect and it looks amazing with so many colors. It adds that extra little touch to any outfit. It is light enough to be worn most seasons when you just need a little something on your arms. Very happy with the purchase. Great buy! This was such good quality and beautiful colors. I would recommend this product to anyone. I purchased it as a gift for my aunt. Gorgeous colors. The picture doesn't do it justice. It is just beautiful. The fabric is a little heavier making it perfect for autumn and winter. The material and colors are perfect. I would recommend this scarf. The actual produce is not as vibrant in color as scarf they are showing in the picture. Beautiful Pashmina Scarf/stole. I haven't seen her to give it to her, but I know she'll love it. I know I did!! I gave this scarf along with the others I purchased as Christmas gifts. This scarf was received well! A touch of class. Very beautiful colors and fabric weight. Can change a boring outfit instantly. I’m a scarves lover and I must Say that I own many, but this one right now it’s my favorite. I recommend highly and gifted it. Very happy. Purchased as a gift. Recipient really liked it. Very soft and pretty color combo. I purchased this item for my sister, and she loved it. beautiful! I getlots of compliments on this scarf. Very nice quality! I got two of them. Looks even better in person. A perfect Christmas gift for my mom who loves scarves. Well now she only loves this one and where is it all the time. This design is great, and even nicer than the picture shows. This was a Christmas gift to a friend and it was enjoyed and the gift receiver really loved it. Thanks! It is lovely. I will wear it with a midi dress in beige , to add color around this 70 year old face. I may be back for more if the quality is good. "What is the fabric? Cotton? Rayon? Acrylic?" 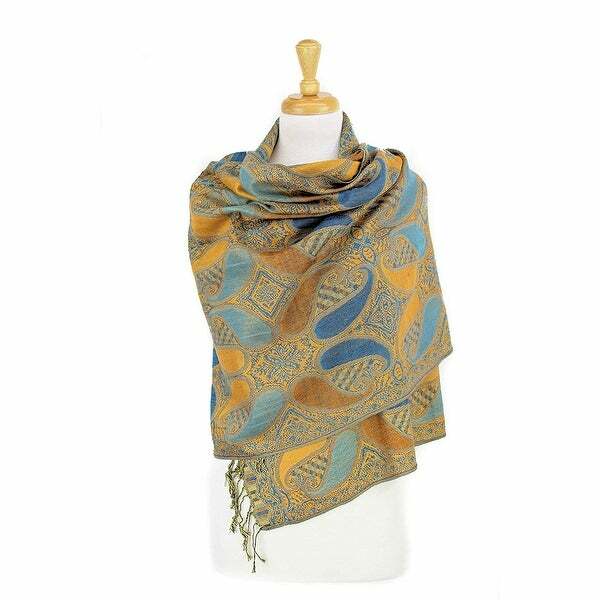 Pashmina is fine type of cashmere, goat wool. In description they are missing such info. Could be artificial, may be %.